The core to every boat is a hull. The hull is the watertight floating body of the boat. It is the support for every other part of the boat. There are an infinity of shapes and sizes all related to purpose and heritage of design. A dinghy is a small sailboat usually under 20 feet long and open for most of its length. A keelboat is usually larger, starting at about 20 feet long and no upper length limit. 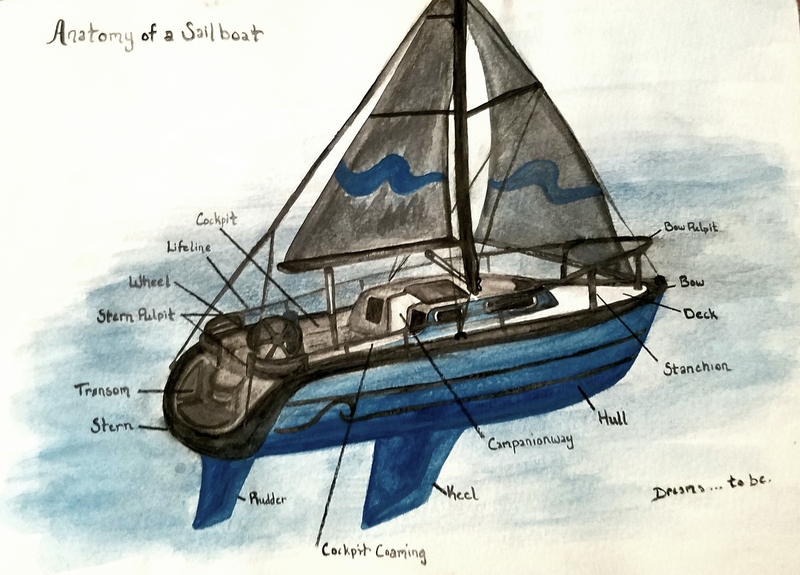 The key difference between the two is that a keelboat has a keel, a fixed appendage on the bottom of the boat that gives sideways resistance to counter the force of the wind on the sails. The keel also carries a ballast, usually made from iron or lead. The weight of which counteracts the force of the wind that causes a boat to heel, or lean over. The keel is shaped in the form of a airfoil wing to generate lift and allow the boat to sail closer to the wind. A dinghy has a centerboard that can be raised or lowered as needed and the crew is used as a live ballast to resist heeling. To top the boat over is to capsize. There are also multihull boats that originate from the indigenous pacific islanders. Catamarans (2 hull) and trimarans (3 hull) are the modern version of this and can be very fast and comfy. Any sailboat is steered by a fin shaped rudder that is attached on the bottom of the boat near the stern. This can be rotated to change the angle that water strikes it. It needs the flow of the water moving past the boat to create the force to turn the boat. A tiller is used to control the direction of the rudder on a dinghy or small keelboat. On larger boats a steering wheel is used to control a series of gears, cables and pulleys that move the rudder. It is called the helm in all kinds of boats and the person steering is the helmsman. A keelboat will not capsize, where as a dinghy can. The ballast in the keel is designed to keep the keelboat from doing so. You will find lifelines as a safety feature on most keelboats. They are usually made of wire cable and are run around the perimeter of the deck, about two feet above it. The wire cables are supported by stanchions. At the bow and stern of the boat, the lifelines are attached to the pulpits. Because there has to be an exception to every rule, there is a boat that exist without a rudder. A sailboard, at its root it is a surfboard with a sail, it has no rudder and the sailor steers the boat by trimming the sail and shifting their body weight. It is a tradition and courtesy before boarding a boat, even when invited, for you to ask “permission to come aboard?” Do join me, and come aboard!